The organisms of the pond are tired of the snapping turtle, Mr. Big, and his reign at the top of the food chain. It is time something was done. So the fish et al. get together and plot his demise with the help of the crows. When an Asian snakehead fish is introduced into the new ecosystem, the community regrets its decision to have Mr. Big eradicated, but the crows see their chance to dominate and refuse to back out. 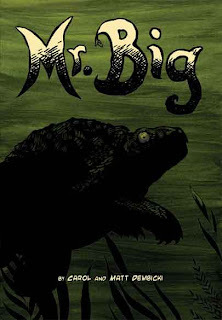 MR. BIG is an anthropomorphic fictional story about the complexity of the naturally self-contained ecosystem that is a pond. Neither didactic nor trite, the Dembicki’s take their understanding of science and delicately weave an interesting tale of revenge and death. MR. BIG is more akin to poetry than prose in that it relies on the illustrations to tell the story rather than the beautifully tight text. Because of the heavy reliance on the illustrations, the story would have been stronger had the artists used color. The illustrations work very well most of the time, but there were a couple of places where the art was confusing and I argue that the use of color would have helped. After all, a pond is full of beauty and the Dembicki’s missed a chance to showcase all of that beauty by eliminating color. This is an all ages read; it is appropriate for any elementary or middle school student who is studying ecosystems. MR. BIG is science and this book is sure to peak the interest of the students in their quest to learn more about the delicate balance of life. In fact, this title could lead to some deep scientific inquiry for elementary students for several weeks. My compadre Scott Tingley, over at Comics in the Classroom, has not only reviewed this book before, but he has posted some lesson plans as well. With his permission, I direct you to his lesson plans. Finding science texts that are not heavy-handed is hard to do. This fact makes MR. BIG all the better when looking for exceptional texts for children. This book makes me want to know more about ecosystems. Science came alive with MR. BIG and I am excited to use this in my classroom.